Here in New Zealand we’re experiencing a bout of wet weather. MetService is NZ’s go-to place for weather information. It can show you the weather six ways before Sunday,* and a whole lot more. Some time ago I wrote about electronic warnings of geological events. GeoNet’s services are excellent, but MetService is no slouch in the e-services department either. Those that haven’t explored the MetService website, do. 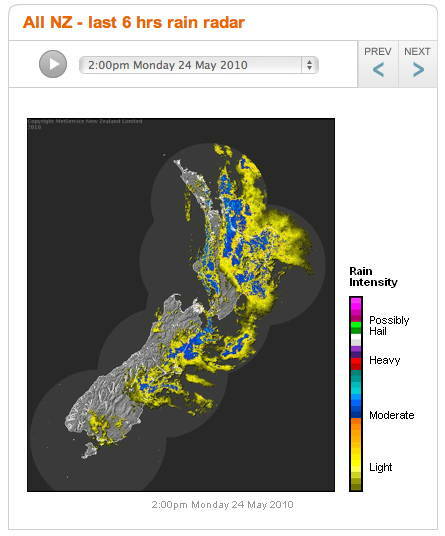 It’s got a great range of weather maps, satellite images, forecasts, hourly rain radar images (like the one shown on the right), information on the national parks and ski fields, marine forecasts, … Go and get lost in it all. Today it was pointed out to me that you can get email alerts to weather warnings via the NZ MetService. Registering for the email service is as easy as entering your name and email address, select the warnings you want from the long list on offer and you’re done. They also offer mobile services, both for browsers and as texts. You can also follow them on twitter. Now you’ve got no excuse not to check the weather before heading out! They even have a blog that features explanations of weather science, usually with a topical angle. One recent article explains how the MetService provides one of nine Volcanic Ash Advisory Centres (VAACs) world-wide; another covers thunderstorms, featuring their lightening strike recordings. Check it out. HT: @five15design, for the tweet on the email feeds. *It’s Monday as I write. Check out the weather where your rellies or friends live!